Memory giant Corsair is jumping into the realm of chassis creation, showing off the first of its new designs at this year's CeBIT show in Hannover, Germany. Building cases is no easy task, nor are companies known for hitting their designs out of the park on their first attempts. We haven't gotten a hands-on look at the new Corsair case, but if the pictures out of CeBIT are any indication, the company looks like it has put some serious thought into the must-have elements of chassis creation. Just to note: These pictures still reflect a prototype of the case, so elements might look a little different when this unnamed chassis hits stores. The full-tower case features five 5.25-inch bays in the front with what appears to be a screwless retention mechanism for each. Nestled beneath these is a four-slot bay for hard drives, hot-swappable into the chassis through a swinging door on the case's front. This feature eliminates the headache of screws and cabling for upgrading (or switching) hard drives around, as you can wire up all of the bays to your PC and power supply and mix-and-match a drive into any slot you want. The motherboard sits atop a tray that features a giant hole cut out around the CPU cooler area. It's not a common element in chassis design, but it's shaves countless minutes (or hours, depending on your skill) when you want to switch around your air- or water-based CPU coolers. The entire process usually requires a motherboard removal as well as the removal of most of your PC from the chassis. The Corsair case minimizes the work by giving you access the necessary cooler retention holes after one quick removal of the case's side panel. Awesome. 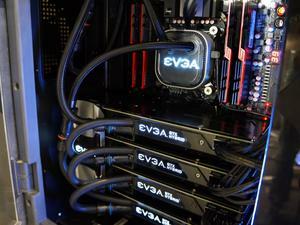 Toward the bottom of the motherboard tray rests a number of rubberized holes for cabling and water-cooling tubes. It's nice to see all of these holes covered by the same split rubber covers that we find on holes typically designed for tubing. This look and grip created by these covers works better than the typical setup: an ugly, gaping hole on the motherboard tray. Corsair's chassis slaps the power supply underneath a plate to isolate it from the rest of your system, and a 14cm fan on top of this plate circulates air in and out of the area. A total of three, 12cm grilled fan mounts sit on the case's ceiling--we couldn't tell if they're going to be populated by fans upon purchase of the chassis or if you're going to have to purchase and install them yourself. If it's the former, we hope Corsair is planning to include LED fans into the equation. We'd hate for the large window on the case's side panel to go to waste. 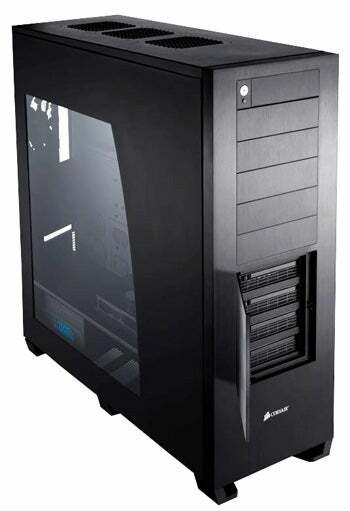 Corsair's inaugural chassis is expected to hit stores in the second quarter of 2009--look for a May release.